Interested in getting to know some local entrepreneurs? The Avery County Chamber of Commerce will host its next Business After Hours event from 5:30-7:30 p.m. on April 12 at Linville Falls Winery. Linville Falls Winery. Photo by Ken Ketchie. Held each month at a different local venue, these events provide an opportunity to get together, exchange information and make new friends for chamber members and prospective members. 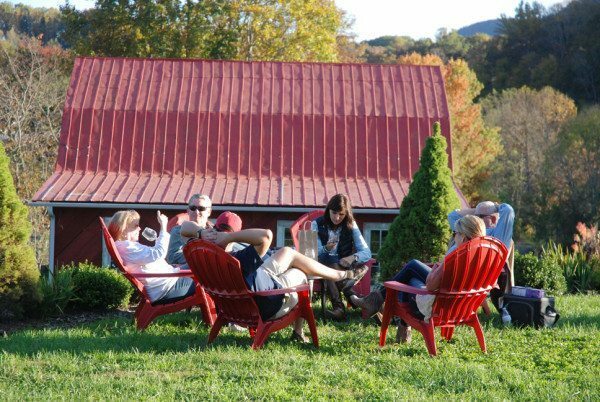 The stunning grounds of Linville Falls Winery will play host to this month’s event, which will feature some of its award-winning wines, live music from Dave Calvert and a sampling of food from other local establishments. The winery sits on a picturesque 40-acre farm that features 10 acres of vines, a Christmas tree farm and a state-of-the-art tasting room in a facility that mimics California wineries. This time around, Elk Mountain Riding Company will be on hand, giving you a chance to tour the grounds on horseback. Lily Livermore, a wine steward at Linville Falls who spends a lot of time riding the trails with her own horses, said it will be a great experience for all involved. Not yet a member of the chamber? No worries. If you’re interested in joining, the After Hours events are the perfect opportunity for you to get involved. The Avery Chamber serves approximately 350-400 members every year, and offers unique personal services for each, like offering them a website through averycounty.com. Planning to attend the April 12 event? Call the chamber at 828-898-5605 to RSVP. For more information, check out averycounty.com. The Avery County Chamber of Commerce and Visitor Center is located at 4501 Tynecastle Highway Unit 2 at the intersection of N.C. Highways 105 and 184 in Banner Elk. It operates from 10 a.m. to 4 p.m. Monday through Friday and from 11 a.m. to 3 p.m. on Saturdays during spring and summer months.